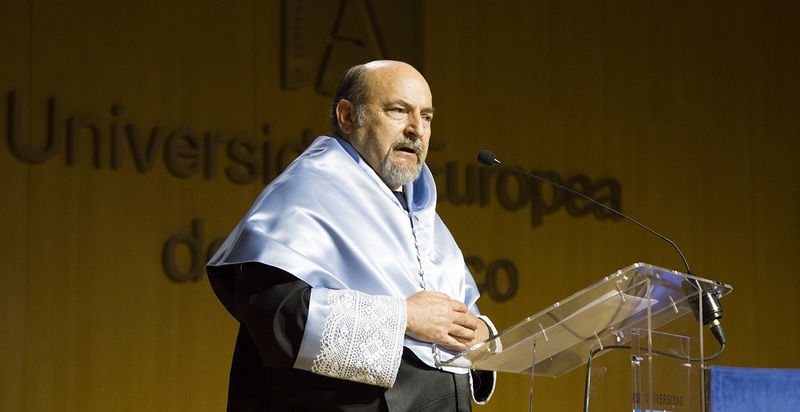 The dean of the Social Sciences and Humanities of the European University of the Atlantic, Federico Fernández, has remembered this morning the beginnings of the academic institution in an emotional speech in which he had kind words for the “leaders” that, much before the UNEATLANTICO building existed, they were already capable of imagining the project thanks to their “entrepreneurial vision”. To conclude, the dean emphasized his personal tenacity in that all students from UNEATLANTICO learned two essential things: work team and communicate well. “He who cannot convince anyone, cannot sell his ideas, personal or professional projects”. And taking the helm, the student from the Degree in Advertising and Public Relations Raquel Ramos highlighted in the speech she pronounced on behalf of her peers that from this class “there is a little family” who has learned really well that throw in the towel is not an option “because what is impossible only takes a bit longer”. “It is the decisions we make what lead us to our dreams”, she said, visibly emotional while remembering anecdotes from these four years that have come to an end, but that “have left a mark” in this first class. 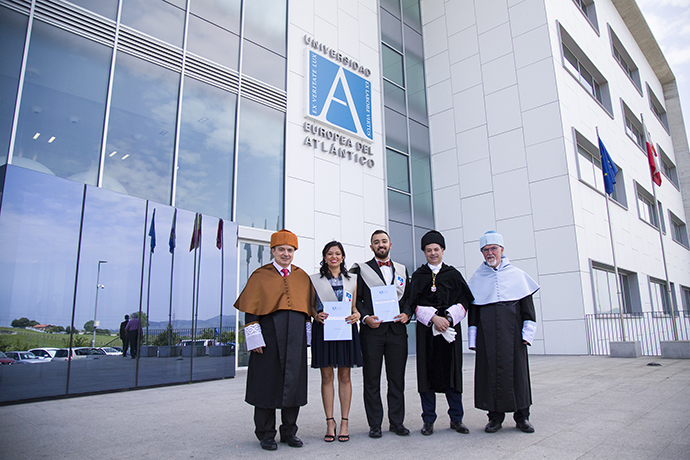 As well, the Chamber of Commerce of Cantabria, Modesto Piñeiro, intervened today in this third graduation act in which students from Journalism, Audiovisual Communication, Advertising and Public Relations, Business Administration and Management and Translation and Interpretation received their degrees. 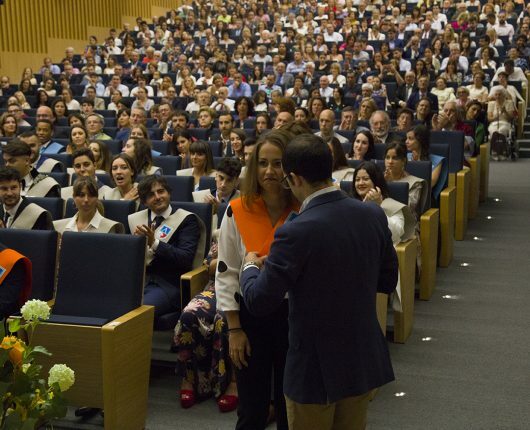 With these words, she aimed to cheer up the recently graduated to begin “with confidence” the stage they have ahead of them because, as he said, “I am very aware that you are well-trained”. “And when you are working, work with joy and enjoy what you do”, he added. In that same line, the CEO of the Iberoamerican University Foundation (FUNIBER), Santos Gracia, invited the recently graduated students to make available their knowledge and capacities to the service of the community in order to improve the world they live in and concluded with the desire that “dreams keep coming true and that new paths continue to open up in the personal and collective future of Cantabria”. 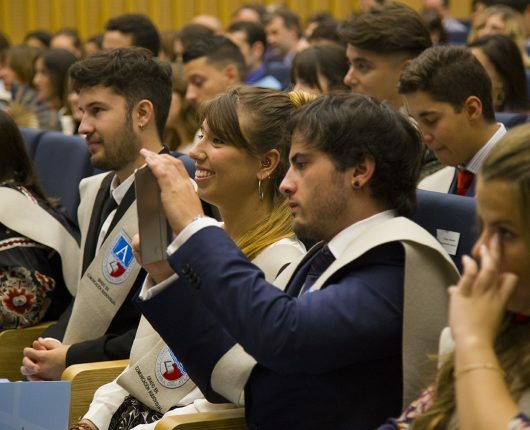 The chancellor, Rubén Calderón, was the one in charge of closing the act with a speech with which he referred to the graduates as the “main characters of this University’s history”. 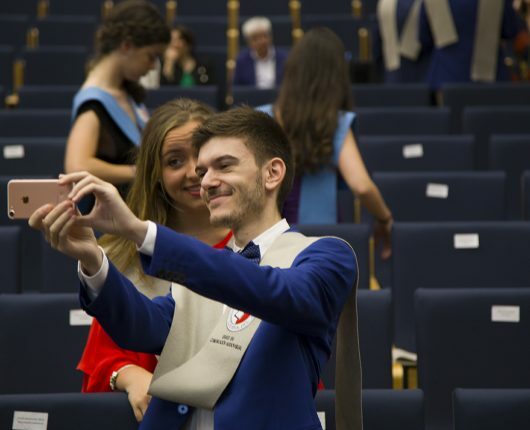 A story that began on September 29, 2014 and that, during these years, has been forging with the “commitment and the responsibility” of the University towards the students and their families. 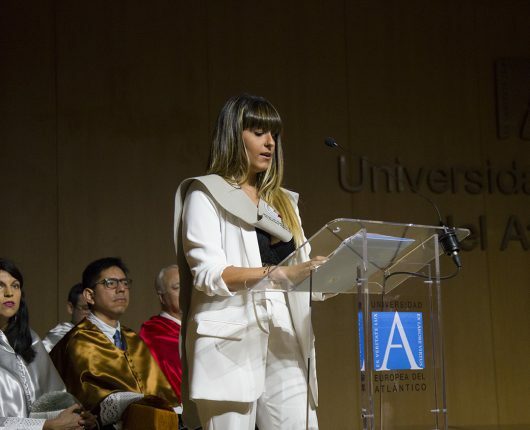 In this act, he also wanted to specially mention the two students from Guatemala, Francisco Valdés and Carmen Andrea Castillo, who have completed the degree in Audiovisual Communication and who are the two first international students graduating in the European University of the Atlantic.